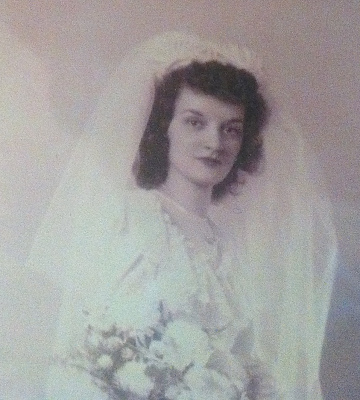 March 11, 2016: My mother would have turned ninety today. She died on June 8, 1998, of sepsis, the result of a reattached ileostomy. Our goodbye still feels like a door left ajar. She was unconscious by the time I reached her hospital room, so the best I could do was whisper and pat her bloated, purple hand. She was gentle and loving. I thanked her for that. And I said she gave motherhood everything. She lost sleep and sweated small stuff. I didn’t use those exact words, but that was the gist. The only sign that she could hear me was her fat hand lifted a little, then fell. Maybe she didn’t catch every detail, but I hoped that she sensed my attempt to surround her with kindness and affirmation. The trouble was, Mom’s end was not certain at that point. I held out hope for a turnaround, so my deathbed blessing was a precaution. But it would have to do. She passed within a couple of days, while I was at seminary in Columbus. By the time I got back to Erie, she was bone and ash in a beige plastic urn. No tender moment with Mom in repose, no soliloquy. And no private crying. Those came at her funeral service, called forth by a hymn, probably my favorite: “Abide with Me, Fast Falls the Eventide.” I was loud and sloppy. It couldn’t be helped. But this was almost eighteen years ago—my Lord! Grief has aged along with me, tears giving way to a longing that visits now and then. I don’t just miss Mom, but also myself as her kid, when life wasn’t perfect, but mostly good and glad. Much as a hymn cracked me open when I was a younger man, music now makes me feel an emptiness in my chest that can only be filled by the past. Give me communion with those who would now be a hundred or more. Let me break bread with the living scattered by the centrifugal force of passing time. Last week Lawrence Welk—of all musicians!—had me pining. At the family gatherings of my youth, elders wanted big band and bubbles on the television. Enduring Bobby and Cissy and token black tap dancer Arthur Duncan was a tariff imposed on us before we pre-pubescents could watch Mutual of Omaha’s Wild Kingdom with Marlin Perkins and Jim Fowler and, of course, The Wonderful World of Disney. My cousins and I regarded the burden as onerous, but now when “It’s The Lawrence Welk Show” belts out from the television and the accordion starts up, my mind and body want to be at Aunt Mart and Uncle Kenny’s house, in the always amiable commotion of generations. The desire for this slice of the past is physical. I swear, when Welk goes “Ah one and ah two and ah,” my heart stirs. Even Joe Feeney’s nasally tenor makes my eyes smile. Mom was in that joyful air, in the rise and fall of voices I can’t remember all that well anymore. I miss her. I miss bumping into those decent old souls and getting overheated running around with cousins. The whole champagne rerun (Public Broadcasting Service) played out as I washed dishes and cooked and let a lovely ache move through me. Not too many days later Karen and Richard Carpenter played the same trick on me—a PBS fundraiser retrospective. Admitting you like the Carpenters is for some people right up there with digging Barry Manilow. Confession: part of me loves them. Karen Carpenter’s voice puts me in another corner of my past’s attic. Family friends stayed late, played cards, gorged on long-gone Armand’s thin pizzas, and laughed until dizzy. I had just hit double digits, and the scene was so loosey-goosey that I scored a fair amount of beer out of the deal. All the grownups loved and played Carpenter’s albums and 8-track tapes. Mom, who was built a little like Karen before the anorexia took over, was at the center of my memory’s comforting song. I can still see “We’ve Only Just Begun” in calligraphy at the bottom of our friends’ wedding photograph, their giddy features pinched against the flying rice. Who says “Goodbye to Love” and “Rainy Days and Mondays” aren’t happy songs? Those years weren’t too shabby, nestled in between my parents’ divorce and the ravages of Mom’s arthritis. Part of my longing is to go back, before I knew how fragile and bruised elderly skin could be, how worry and disappointment can hunch your back, how some dreams end as wisps of smoke. But that’s not all. I want to dunk my Grandma Coleman’s molasses cookies again, sit on the floor of a room packed with relatives as Tinkerbell blesses the Magic Kingdom with pixie dust and Fowler saves Perkins from a boa constrictor, and watch Mom tease her hair, then set it in curls with Dippity Do and bobby pins. I wish for Karen Carpenter to sing again. I want to rewind Lawrence Welk’s sign-off and listen back when I couldn’t wait for it to finish. Adios, au revoir, auf wiedersehn till then. You know you’ll always remain in my heart. Good night, sleep tight, and pleasant dreams to you. Here’s a wish and a prayer that ev’ry dream comes true. Adios, au revoir, auf wiedersehn. I’m not wiping away tears. My hand is drawn to my chest, though, and I’m sighing. Sadness and gratitude sit together. This is the best happy birthday I can say to Mom right now. I didn’t know young guys like you remembered this stuff. Karen Carpenter sang me through a few tough patches, and I have a grudging habbit of looking for Welkvon Saturday nights just for the big-band sound of my youth. Your mom sounds better than mine or Timmie’s could ever be. Oh, heck yeah. I think my television memory came online in the late 60s. And big band! Don’t get me started. All the way home from Greenville yesterday I listened to the Glenn Miller station on Pandora. Lively, but civilized! Lawrence Welk! How we loved that show, especially when we watched it with grandparents who loved it. Beautiful, nostalgic tribute! My heart gets wistful too. And now I’m going to dig out that molasses cookie recipe and bake a batch. Well, this brought tears to my eyes – have similar memories growing up on the other side of the boarder. I feel your pain(! )…Sending you, your family and community lots of healthy vibes for happier days ahead.